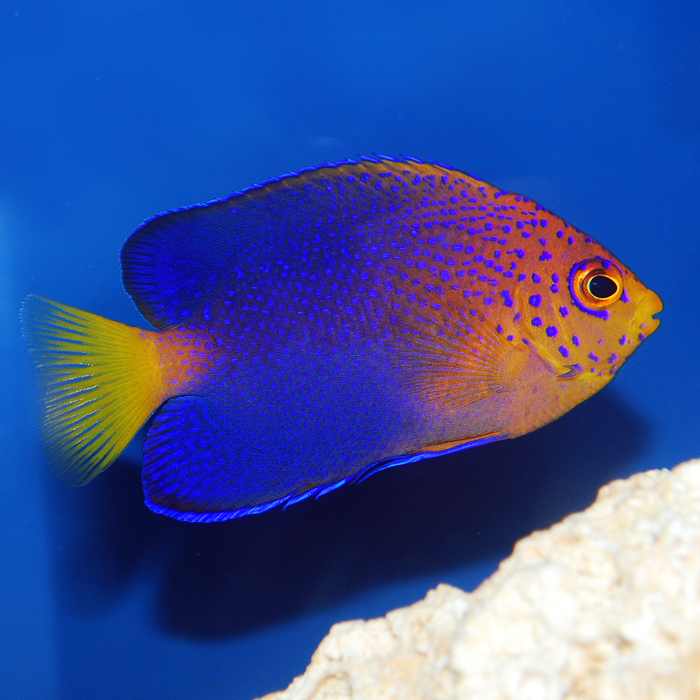 The Japanese Angel is a highly sought after fish, but it is not often collected and is uncommon in the aquarium trade. They’re the largest of the pygmy angels, growing up to six inches. They can be kept in reef tanks as small as 30-55 gallon tanks with many hiding places when young, but will need up to a 75 gallon aquarium as adults. They are sometimes finicky eaters and should be well conditioned before adding to the display tank. Like all angels, some will pick at corals and clams, so they need to be observed in a reef tank. These angels prefer cooler water, but may adapt to reef temperatures. Some pygmy angels can be mixed together, but it’s best to have one Centropyge per tank unless the tank is large as they will usually fight. They do very well with the larger angels and usually can be mixed easily. They thrive in FOWLR tanks and get along with most other fish. They do best in established tanks, whether reef or FOWLR tanks. They will pick on algae in the tank, but should be fed nori, flakes and formula foods. This uncommon fish is very expensive, even though they have bred in captivity.